Description: Comfortable Transitional Design made of cherry veneer and birch solids finished in a lightly distressed warm cherry with a satin sheen. 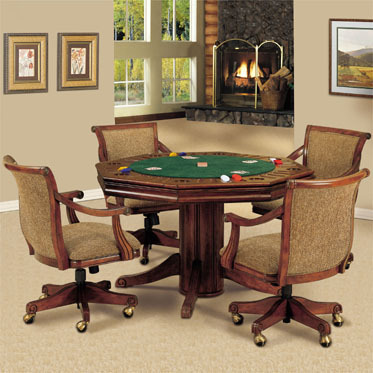 The top has hand matched cherry veneer on one side and a round green felt card playing surface with chip and drink holders on the other Under the top is a hidden roulette game board, wheel and 2 chip racks. Roulette game pieces, chips and playing cards included. Price for Table is $695.00 local area. Out of State shipping applies.